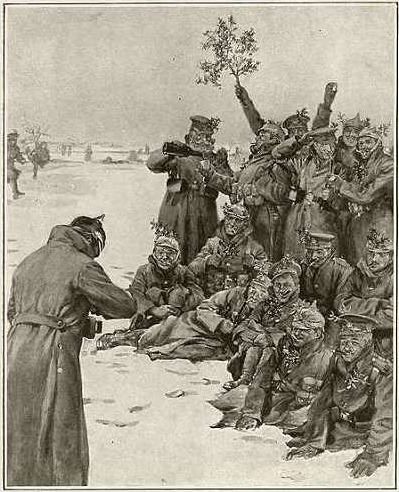 In a place where bloodshed was nearly commonplace and mud and the enemy were fought with equal vigor, something surprising occurred on the front for Christmas in 1914. 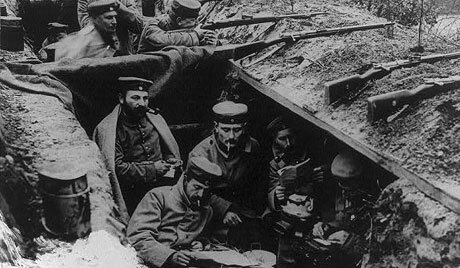 The men who lay shivering in the trenches embraced the Christmas spirit. In one of the truest acts of goodwill toward men, soldiers from both sides in the southern portion of the Ypres Salient set aside their weapons and hatred, if only temporarily, and met in No Man’s Land. Once the trenches were built, winter rains tried to obliterate them. The rains not only flooded the dug-outs, they turned the trenches into mud holes – a terrible enemy in and of itself. Mud lay deep in the trenches; they were caked from head to foot, and I have never seen anything like their rifles! Not one would work, and they were just lying about the trenches getting stiff and cold. One fellow had got both feet jammed in the clay, and when told to get up by an officer, had to get on all fours; he then got his hands stuck in too, and was caught like a fly on a flypaper; all he could do was look round and say to his pals, ‘For Gawd’s sake, shoot me!’ I laughed till I cried. But they will shake down, directly they learn that the harder one works in the trenches, the drier and more comfortable one can keep both them and oneself. The trenches of both sides were only a few hundred feet apart, buffered by a relatively flat area known as “No Man’s Land.” The stalemate had halted all but a scattered number of small attacks; thus, soldiers on each side spent a large amount of time dealing with the mud, keeping their heads down in order to avoid sniper fire, and watching carefully for any surprise enemy raids on their trench. We hated their guts when they killed any of our friends; then we really did dislike them intensely. But otherwise we joked about them and I think they joked about us. And we thought, well, poor so-and-so’s, they’re in the same kind of muck as we are. Perhaps it will surprise you to learn that the soldiers in both lines of trenches have become very ‘pally’ with each other. The trenches are only 60 yards apart at one place, and every morning about breakfast time one of the soldiers sticks a board in the air. As soon as this board goes up all firing ceases, and men from either side draw their water and rations. All through the breakfast hour, and so long as this board is up, silence reigns supreme, but whenever the board comes down the first unlucky devil who shows even so much as a hand gets a bullet through it. Even without a cessation of war for Christmas, family and friends of the soldiers wanted to make their loved ones’ Christmas special. They sent packages filled with letters, warm clothing, food, cigarettes, and medications. Yet what especially made Christmas at the front seem like Christmas were the troves of small Christmas trees. They finished their carol and we thought that we ought to retaliate in some way, so we sang ‘The First Noël’, and when we finished that they all began clapping; and then they struck up another favourite of theirs, ‘O Tannenbaum’. And so it went on. First the Germans would sing one of their carols and then we would sing one of ours, until when we started up ‘O Come All Ye Faithful’ the Germans immediately joined in singing the same hymn to the Latin words ‘Adeste Fidéles’. And I thought, well, this was really a most extraordinary thing – two nations both singing the same carol in the middle of a war. In some parts of the line, representatives of each side would meet in the middle, in No Man’s Land. We shook hands, wished each other a Merry Xmas, and were soon conversing as if we had known each other for years. We were in front of their wire entanglements and surrounded by Germans – Fritz and I in the centre talking, and Fritz occasionally translating to his friends what I was saying. We stood inside the circle like streetcorner orators. Soon most of our company (‘A’ Company), hearing that I and some others had gone out, followed us . . . What a sight – little groups of Germans and British extending almost the length of our front! Out of the darkness we could hear laughter and see lighted matches, a German lighting a Scotchman’s cigarette and vice versa, exchanging cigarettes and souvenirs. Where they couldn’t talk the language they were making themselves understood by signs, and everyone seemed to be getting on nicely. Here we were laughing and chatting to men whom only a few hours before we were trying to kill! Some of those who went out to meet the enemy in the middle of No Man’s Land on Christmas Eve or on Christmas Day negotiated a truce: we won’t fire if you won’t fire. 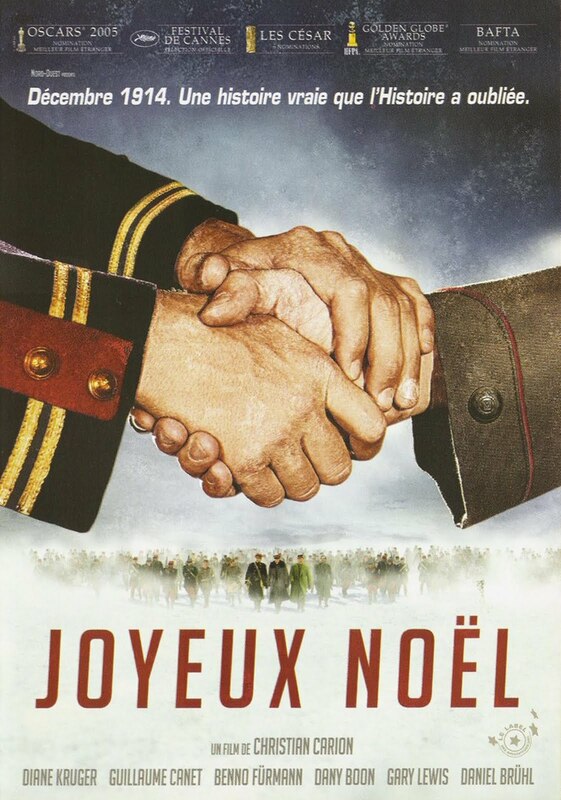 Some ended the truce at midnight on Christmas night, some extended it until New Year’s Day. One reason Christmas truces were negotiated was in order to bury the dead, many of whom had been there for several months. Along with the revelry that celebrated Christmas was the sad and somber job of burying their fallen comrades. On Christmas day, British and German soldiers appeared on No Man’s Land and sorted through the bodies. In just a few rare instances, joint services were held for both the British and German dead. Yet many soldiers enjoyed meeting the un-seen enemy and were surprised to discover that they were more alike than he had thought. They talked, shared pictures, exchanged items such as buttons for food stuffs. 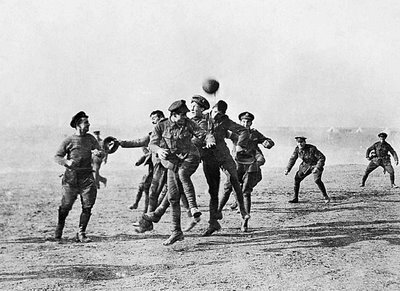 An extreme example of the fraternization was a soccer game played in the middle of No Man’s Land between the Bedfordshire Regiment and the Germans. A member of the Bedfordshire Regiment produced a ball and the large group of soldiers played until the ball was deflated when it hit a barbed wire entanglement.